It's been almost a full year since Warner Bros. released the first Ocean's Eight photo, featuring Sandra Bullock as Debbie Ocean and her team of thieves riding a New York City subway. Today we have the second official photo with Sandra Bullock alongside her seven partners in crime, played by Cate Blanchett, Sarah Paulson, Mindy Kaling, Rhianna, Anne Hathaway, Helena Bonham Carter and Awkwafina. 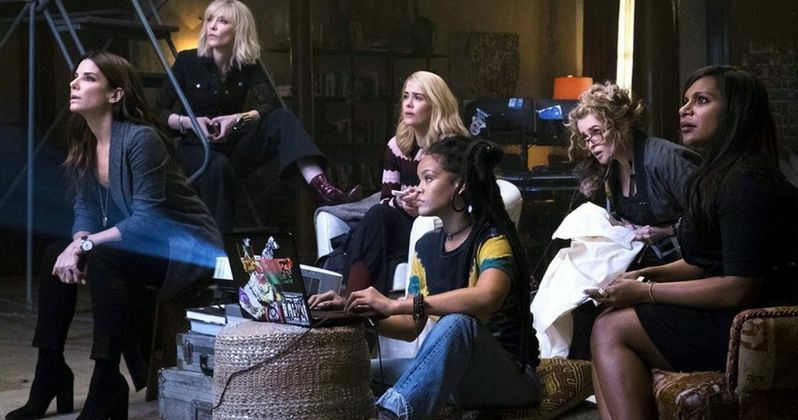 This all-female heist thriller is following in the footsteps of last year's Ghostbusters, whose all-female cast was often the subject of online vitriol. When asked if this cast has gone through the same type of thing on this movie, Sandra Bullock had this to say. "They did put (the Ghostbusters cast) through hell. And I'm still trying to figure out why. Forget what the final product was! There were four or five of the most talented comediennes in that film. Everyone should've just taken a breath and said, 'let's see what happens.' It doesn't take just five people to make a movie. It's pretty much like around 300. So I keep reminding everybody, if you hate my film remember there's another 299 people all around me. We're not a reboot. We're just a this is what's happening in 2017. It's not even a passing of the torch. It's a parallel story of another family member that was raised in the same family Danny Ocean was and what happens when Debbie steps out of jail with all of these amazing, powerful women." The story centers around these eight thieves as they attempt to pull off a heist at the Met Ball in New York City. While it remains to be seen if George Clooney (who serves as an executive producer) will return as Danny Ocean, it has been confirmed that Matt Damon's Linus Caldwell will return for a cameo. The story will also conform to the archetype set forth in the Ocean's Eleven trilogy, with each member of the team having their own specialty. Here's what Sandra Bullock had to say about the other characters' specialties below. "Everyone has their specialty, yes. What's fun is that it's not their whole life. And they haven't been able to do what they're brilliant at because the industry, if you can call it the industry, the industry of crime hasn't really allowed them to excel and execute what they're good at. So you'll find one who's a stay-at-home mom with two children who sells things on the QVC. And here comes Debbie Ocean who enlists their help of them, but not because she only wants females. It's really fun. Imagine all eight of us crammed into a makeup trailer in the morning. You think that it would be disastrous but it was heaven, all of us just sharing information, all of us doing three jobs with families, our other jobs, the juggling. And then we get to shoot this movie together." As for the story itself, Sandra Bullock doesn't give too much away, except that at the beginning of the film she's just getting out of jail after a five-year stretch, although why she was sent to prison is not revealed. Warner Bros. has already set a summer 2018 release date of June 8, which has no other movies opening in wide release. When asked about the possibility of a sequel, which EW suggests would be called Ocean's Nine with Emma Stone being brought into the mix, Sandra Bullock had this to say. "How great would that be? I don't know. I think the mindset was let's just see if we can make this work, and let's see if we can get the greatest actors and we did. Let's see if we can take the original and then make our own version, sort of pay homage to the Ocean series.I don't like sequels. Well, you know what, I don't like the sequels that I've done. I mean, I should just correct that. My sequels were done in the time where it was sort of, oh, the first one worked, let's just slap something together for the second one. And that's not the way things are anymore. Things have changed as people realize we need to step up our game, have something as good if not better. If something strikes a chord, an Ocean's 9 would be ideal." The supporting cast includes Katie Holmes, James Corden, Richard Armitage, Olivia Munn, Dakota Fanning and Adriana Lima. Gary Ross directs from a script he co-wrote with Olivia Milch, with George Clooney, Ocean's Eleven director Steven Soderbergh and Susan Ekins producing. Take a look at this new photo from Ocean's Eight, courtesy of Entertainment Weekly.